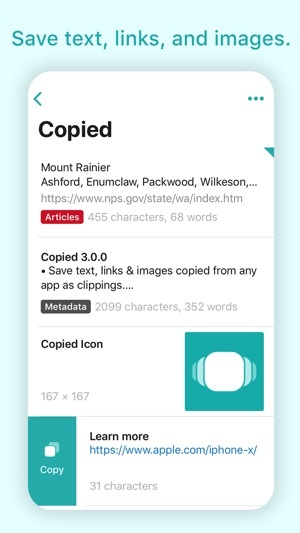 Save snippets of data with Copied so that you can easily find them when you need them. 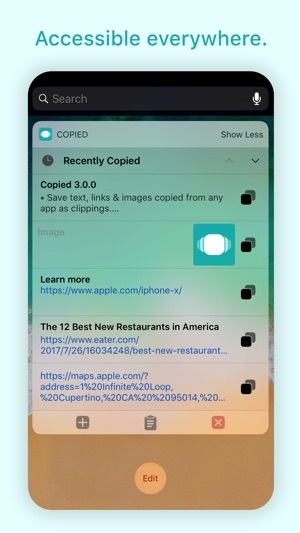 • Save text, links & images copied from any app as clippings. • Copy clippings back to your clipboard and paste them anywhere. • Transform clippings with text formatters or create your own. 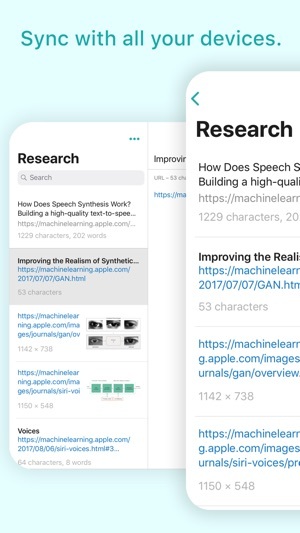 • View and edit the data on your clipboard. • Use the built-in browser to automatically save all data copied from a web page. • Optimized for drag and drop on both iPads and iPhones. • Drag multiple clippings into the action bar to perform batch actions. Copied also comes with several app extensions to enhance your daily workflow. 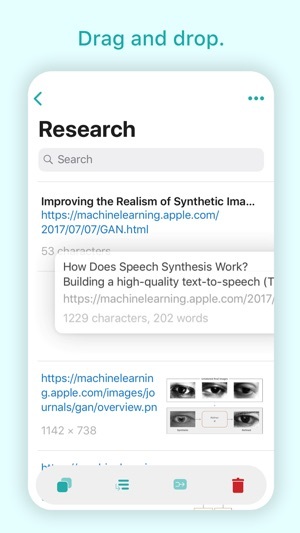 • Input saved text and links directly into any text input field. • Find the clippings you want with search. • Provides quick access to all your clippings without switching apps. • View the contents of your clipboard and clear it if necessary. • Copy and save clippings right from the widget. • Multiple actions are also provided in the iOS share sheet. • The Save to Copied action will immediately save text, links and images directly to Copied. • The Copied Clipper will display the data to be saved and allow changes to be made before saving. • The Copied Browser will open links in the built-in browser so that you can quickly save multiple snippets from a web page. • Use images saved in Copied as stickers. *Copied for macOS sold separately in the Mac App Store. Need help using the app or do have more questions before you purchase? Visit http://copiedapp.com/help to read our FAQ or send an email to contact@copiedapp.com. - Fixed issue introduced in the last update where Copied does not save your clipboard. ... and it is certainly the case here. One of those utilities that truly does make life easier everyday. I find most apps are not necessary to have across all are not to have across all three of my devices: iPad Pro, iPhone7 and MacBook. However, some are and make my life a whole lot easier, and this is one of them. As a student and entrepreneur with a busy schedule and multiple todo lists, calendars, writing assignments, notes, etc, I am copying and pasting information all day, all night and it's nice to have a way to categorize and keep all of these pieces of important information so I can make a time to go through my lists and assign what I have copied into all of the appropriate areas. Also, I use digital textbooks at all times when possible , plus need to read many research PDF's all of which allow for note taking, which allows me to go back, copy and paste my notes into a folder for study guides or for writing papers. 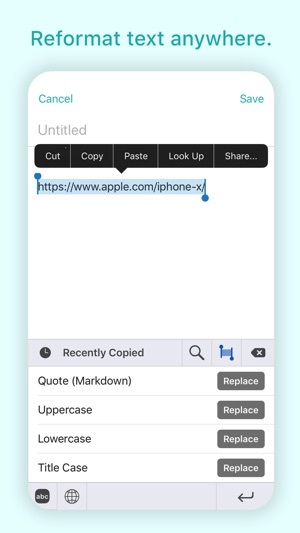 I know that there is now a universal copy and paste feature across all new Apple devices, but this is just quick, convenient and well worth the very small amount of money invested. My only wish is that the developers keep this great app up and if necessary add features that will continue to help support them as well. Yes, I’m a PC person so I have Clipmate and Snagit and use both daily. Many years ago I had an iPad and used a MacBook and while I loved both, technology and I have aged. At that time nothing like this app existed. I just got another iPad so I can use the latest apps- they are too new for my old iPad. My old one clocks out at iOS9. I am very excited that this app exists. I’m still on the lookout for an app that will do what this app does plus: Not requiring manual transfer of every clip at the time you collect it if your “copied” location is full. Yes you can store 10 clips before they disappear. There are times I am attending a presentation and I want to take clips from the chat board without having to leave the webinar. I could take more than 10 clips easily. After iOS 10.3, I needed this! Update: Can't paste the URL! I have been copying and pasting information about books from websites into email, to make recommendations. After the latest iOS update, the information has been going in double spaced and I have had to do manual editing. I've searched for a solution to this but could not find one. "Copied" has solved the problem and made it very easy to do this without the double space. It has been working flawlessly so far! Update: After the latest update I can no longer do what I need. I can select the information and paste it, but I don't seem to be able to copy the link. When I try to paste, I only get the book information all over again. No URL. I have to go back to the regular browser to copy and paste the link even though it shows in Copied. This takes the app from 4 or 5 stars down to 2 stars for me. If I cannot copy and paste the link, this really changes the usefulness of the app.